Waterpik have come out with their latest and most advanced portable water flosser yet. 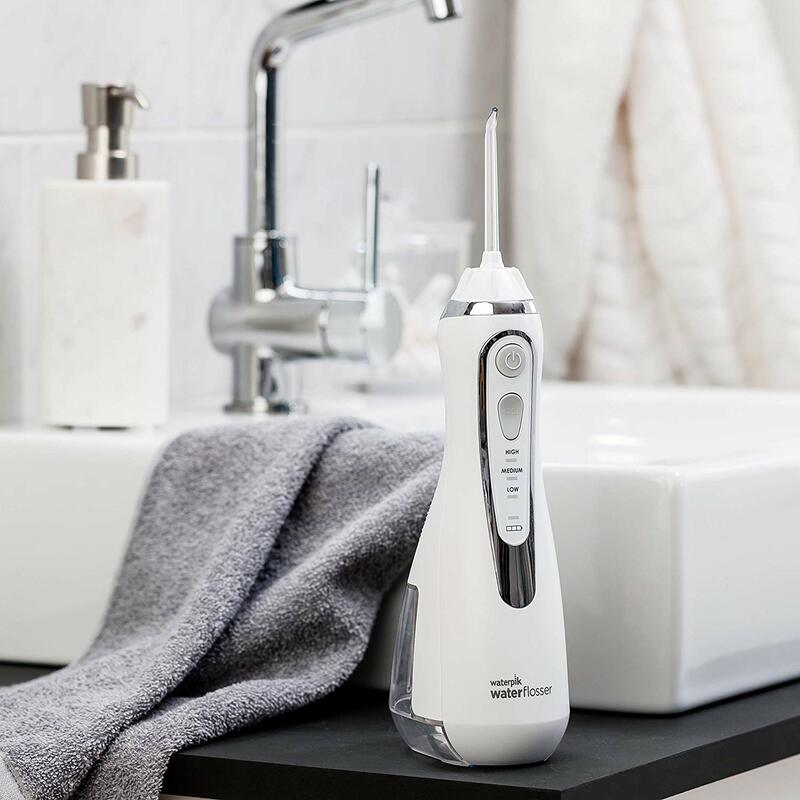 The Waterpik Cordless Advanced WP-560 is a fantastic choice for people with limited countertop space in their bathroom, or those who frequently travel and want to bring a water flosser with them. If the included premium travel bag isn’t obvious enough that it is primarily designed for travel, then how about the fact that it has global voltage compatibility? That’s right, you can take this with you anywhere in the world and plug it into the outlet without any issues. Also included are four flosser tips: two Classic Jet tips, a Plaque Seeker tip, and an Orthodontic tip. They also have their own protective case which can also fit into the included travel bag. With three pressure settings to choose from and the ability to swap the flosser tips whenever you want, you can easily customize your flossing experience to suit your needs. Let’s take a close look at the features mentioned above in more detail. Does it really work as well as it is advertised? At the front of the unit are two buttons: the power button and the pressure control button. It is obvious what the power button does, but how does the pressure control work? Pressing it cycles the water pressure settings from low, medium, and high (indicated by the lights below). At the bottom is the battery indicator, which lets you know how much battery life is left. The lowest pressure setting is 45 PSI, and the highest is 75 PSI. 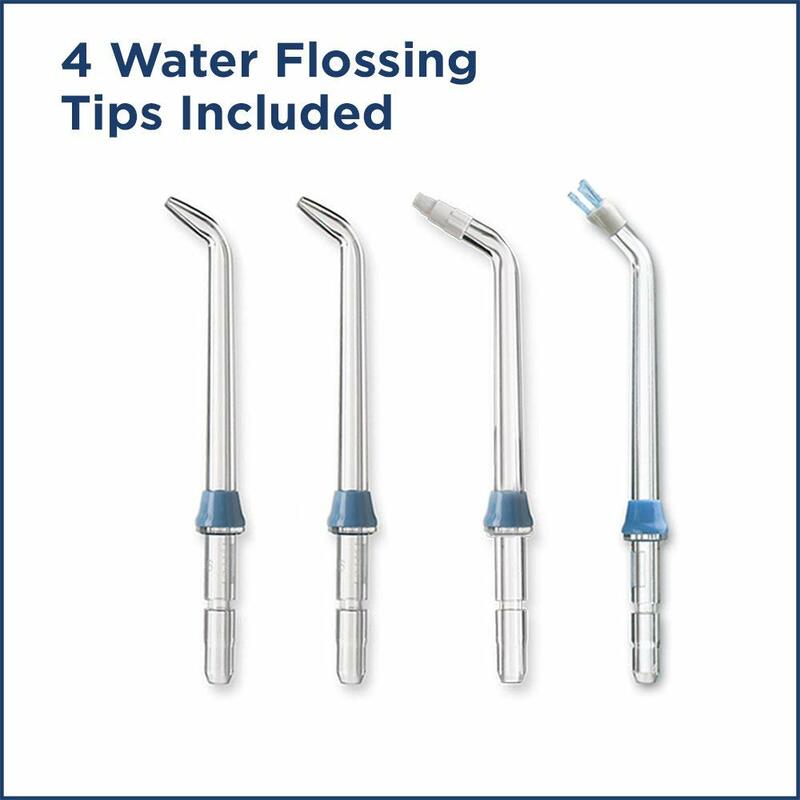 If you’ve used a Waterpik countertop water flosser with 10 pressure settings before, this is approximately equivalent to a 4 and 7 respectively. At 45 PSI, even the lowest pressure setting can pack quite a punch, so we recommend you start there. 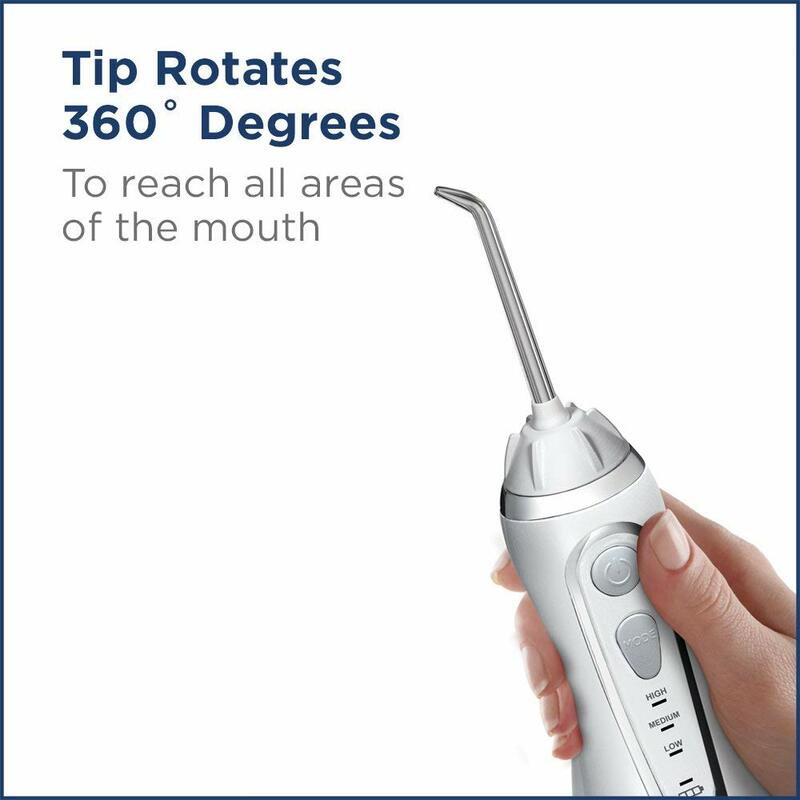 Located at the head of the unit is where you can insert the various flosser tips that are included with the WP-560. You must insert the flosser tip until you hear a click sound, otherwise it is still loose. Once inserted, you can rotate it 360 degrees in increments of about 45 degrees. This helps you angle the flosser to hard to reach areas of your mouth without needing to bend your wrist into awkward positions. The grey button nearby ejects the flosser tip so that you can clean or replace it. Located at the back is the water reservoir. It is quite small, capable of holding only 7oz (210ml) of water. From our testing, at the highest pressure setting it lasts only 30 seconds (extend the time by using a lower pressure setting). You can fill it with water by opening the cover, or detach it completely if you find it easier to fill the reservoir by itself. Above the water reservoir you will find a large dotted section that you can hold for more grip when flossing. Overall the body of the Cordless Advanced should fit comfortably in your hands. You can even use it in the shower as it is water resistant. 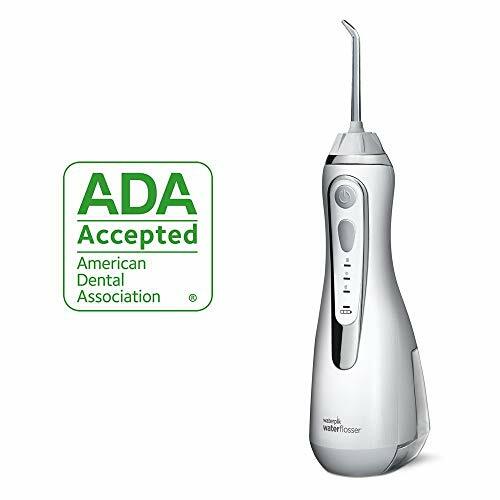 As mentioned earlier, the Cordless Advanced comes with four flosser tips as well as a travel plug. There are two Classic Jet tips that come with all Waterpik products, a Plaque Seeker tip, and an Orthodontic tip. The Classic Jet tip is fantastic for general use for the average person. The Plaque Seeker tip has three tufts of bristles that allows you to scrub your teeth and floss it at the same time. It is recommended for use on bridges, crowns, and implants. The Orthodontic Tip has a narrow cluster of bristles that give more scrubbing power and are great for cleaning braces. These tips can be quickly and easily swapped out by pressing the eject button and replacing it with another. It is recommended that you replace the Classic Jet tips every 6 months, and the Plaque Seeker and Orthodontic tips every 3 months. Let’s take a look at the charger next. 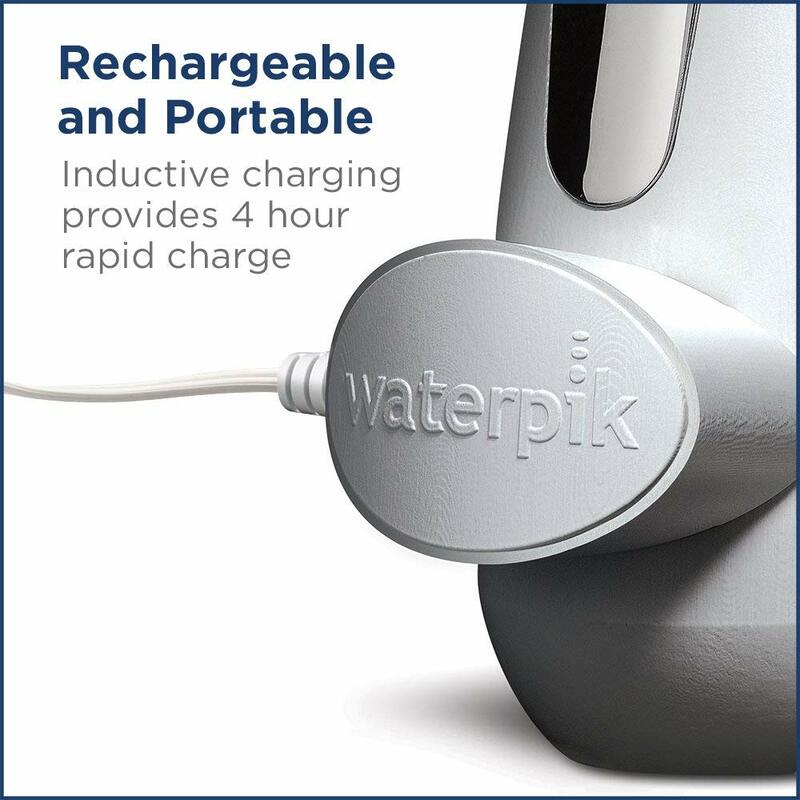 Waterpik have simplified the charging process with the magnetic charging pad. You don’t even need to plug anything into the WP-560, the magnetic pad will latch onto the front of the device and begin charging. Pretty cool, huh? Furthermore, the Cordless Advanced has global voltage, meaning you can use it domestically or internationally without worrying about frying it. Furthermore, it boasts an impressive charge time of only 4 hours. It has a built-in rechargeable battery so you never have to worry about carrying extra batteries with you. And to further drive home the point that this product is indeed designed for travel, Waterpik have conveniently included a premium travel bag and a plastic case for your flosser tips. You can store your WP-560 unit as well as the flosser tip case in the water resistant bag to ensure everything is protected and easy to find. The travel plug will prevent any residual water from leaking out from the hole at the top. 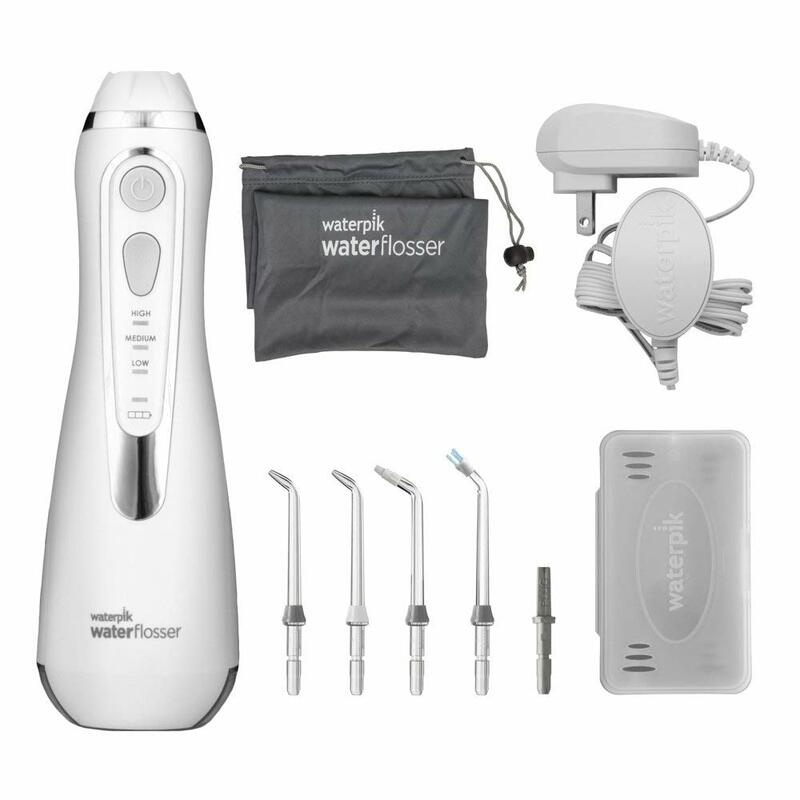 If you are someone who enjoys traveling and also wants to maintain a high standard of oral hygiene, you should definitely consider purchasing the Waterpik Cordless Advanced WP-560. Waterpik have done an excellent job designing a compact flosser that still packs quite a punch. We really liked how it has global voltage compatibility, meaning we don’t have to bring an additional travel charger or risk frying it in an outlet. With the included flosser tips, you can give yourself a fantastic clean even when you are away from the comforts of home. © Oral Care Expert. All rights reserved.